A picamilone dosage works to increase blood circulation to the brain -helping to reduce stress and boost your mental powers at the same time. It has been hailed as one of the few treatments for depression that calms and stimulates without making you drowsy or lethargic. In a series of Russian medical studies, picamilone use as an anti-anxiety drug was compared to other stimulants and treatments for depression including piracetam, Vinpocetine and Xanthinol niacinate. The stimulant properties of picamilone were found to be more potent than piracetam, and anxiety-induced giddiness and shakes were eliminated amongst the trial group. Further Russian medical trials involving piracetam also reported benefits in the treatment of mild memory loss, and emotional, hearing and speech problems. And as we’ve discovered, patients using picamilone do not display common side effects of treatments for depression, such as sleepiness, relaxed muscles or lethargy. Picamilone also scores highly as an effective vasodilator, with the ability to Improve Blood Circulation. Tests have shown it beats both Hydergine and Vinpocetine in the action to increase blood circulation, by acting to boost both intracranial and cortex blood circulation around the brain. A picamilone dosage has been compared to the antiaging Nootropic drug known as Hydergine, which also helps to increase mental alertness and brain power. There are also parallels with the cognitive enhancer drug idebenone and treatments for depression linked to low serotonin levels such as the 5-HTP supplement. 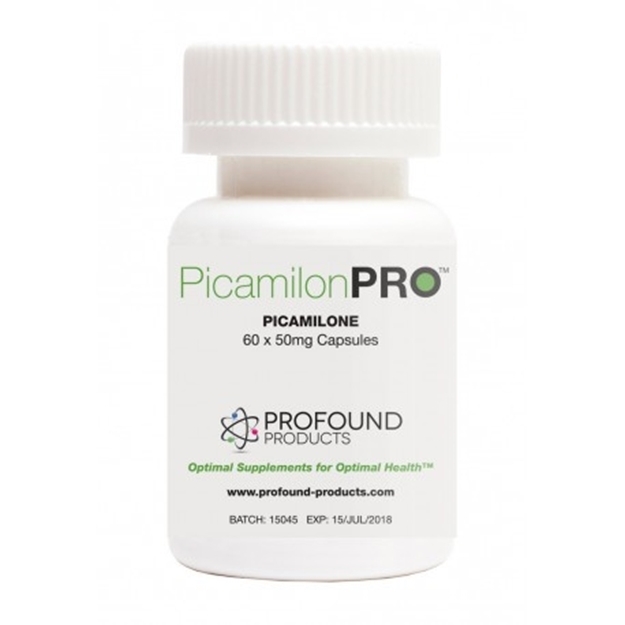 Picamilone is based on one of the body’s key neurotransmitters found in the central nervous system known as GABA -short for gamma-Aminobutyric acid. It is chemically bonded with nicotinic acid (vitamin B3) to create a GABA supplement that acts to calm anxiety whilst boosting brain activity. This double action capability has led picamilone to be commonly used to restore health and emotional wellbeing in trauma sufferers and people with neurotic disorders manifesting fear, anxiety, and emotional and vegetative instability. The picamilone safe to use formula has seen wider application of the drug -from migraine and headache relief, to alcoholism and even treatment for eye conditions such as glaucoma, optic nerve problems and diseases of the retina. Picamilone’s action to increase blood circulation and vasodilator activity also resonates with Blood flow related conditions such as cardiovascular heart disease. Stress, diet and lifestyle are all known factors in the development of Coronary Heart Disease, cardiovascular disease and arterial stiffness -a condition directly linked to heart problems and cardiovascular health. Arterial stiffness can be identified and monitored using technology such as the Bio Clip Cuff, while stress, anxiety and the drive to Improve Blood Circulation are addressed through picamilone. As an effective, tried and tested anti-anxiety drug, picamilone’s side effects are minimal. On rare occasions, people have experienced headaches, dizziness and nausea. While picamilone may be used in tandem with other nootropic drugs, such as centrophenoxine and piracetam, it’s advisable to reduce the overall dosage to avoid headaches, nausea and vertigo. At high dosages, always seek your doctor’s advice if you are intending to use picamilone with high potency vasodilators such as ginkbo biloba, Nicergoline, vinpocetine or xanthinol nicotinate. And because picamilone acts as a mild reversible MAO-A inhibitor to tackle depression and anxiety, avoid high doses without medical advice, if in combination with other MAO-A drugs (such as Deprenyl, Gerovital H-3) and general anti-depressants (including Prozac, Paxil and Zoloft). A typical picamilone dosage is 50mg to 100mg up to three times a day, with occasional breaks. The good news is that a picamilone dosage acts fast -often within an hour or so -giving you the power to beat stress and boost your mental prowess quickly and effectively. As both a mental stimulant and one of the few treatments for depression that doesn’t cause drowsiness or lethargy, picamilone is a trusted GABA supplement that helps bring calmness and clarity to everyday life. I’d heard so much about picamilon and have been looking for it for a long time. I’m pleased to say that after using it for several weeks now that I’m pleased with the results. My anxiety is much improved and I can get on and do a normal day’s work, which I was prevented from doing on the previous drugs I was prescribed. There are many known treatments for depression. The vast majority of these however are synonymous with the negative side effects they induce. Most commonly drowsiness, lethargy and loss of energy. Picamilone is not only an effective and popular treatment for anxiety and depression, it’s also a powerful vasodilator. By increasing blood flow around the body and oxygen to the brain, Picamilone maintains energy and concentration levels, increases mental alertness, and reduces feelings of lethargy. Picamilone powder is even used as a safe and effective treatment for migraines, glaucoma, and alcoholism. A typical dosage of Picamilone is one 50mg tablet up to three times a day. Despite its profound and varied properties, side effects are minimal and rare, with only very occasional reported cases of headaches and nausea. Description: Picamilone is a clever combination of GABA and Niacin. By chemically bonding these two vitamins new and unique cognitive enhancing effects are achieved. Avoid use if you are taking MAO inhibitors or vasodilators. Directions: Take 1 or 2 tablets, one to three times daily.